In this lesson, we will learn how to order mixed numbers from the least to the greatest or vice versa. 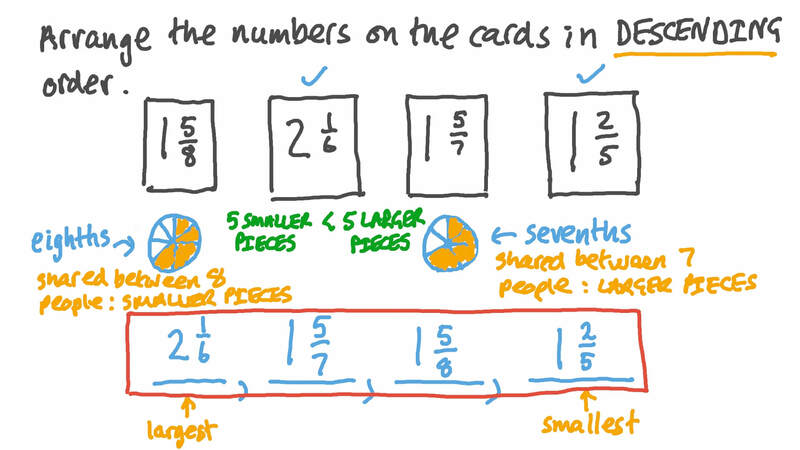 Arrange the numbers on the cards in descending order. Arrange 1 2 3 , 2 1 2 , 2 1 7 in ascending order. Order 3 4 5 , 3 1 1 1 , and 3 2 3 from smallest to largest. In a gym, Amir exercised for hours, Sameh exercised for hours, and Ramy exercised for hours. Arrange the names in the order of who exercised most to least. Order the given fractions from least to greatest: 1 0 1 3 , 1 0 1 2 , 1 0 2 1 5 , 1 0 1 2 2 0 . Arrange the following in ascending order: 3 0 8 1 0 , 30.1, 3 0 9 1 6 , 3 0 3 8 , 1 5 3 5 , expressing each as a decimal. Sameh is feet tall. His brothers Adel and Fares are feet and feet tall, respectively. Arrange the siblings in order from tallest to shortest. Order the given fractions from least to greatest: 3 7 1 8 , 3 1 8 , 3 2 3 , 3 3 6 . Arrange the following in ascending order: 9 4 1 0 , 9.725, 9 1 1 1 6 , 9 1 8 , 4 6 5 , expressing each as a decimal. Arrange 1 2 3 , 1 1 2 , 2 1 3 in ascending order. Order 8 1 4 1 5 , 8 1 8 , and 8 7 1 1 from smallest to largest. Order 1 6 7 , 1 2 1 1 , and 1 1 3 from smallest to largest.